Most of you who uses Ubuntu 11.04 "Natty Narhwal" on a system with an ATI graphics card must be aware that the ATI proprietary driver (Catalyst/fglrx) available in the Ubuntu repository does not work with Unity. Unity works with the open source Radeon driver but with the newer ATI cards there are a lot of problems. Switching between the ATI discrete card and Intel integrated card is very troublesome with the Radeon driver. Another problem is that, as far as my experience goes, the Radeon driver tends to overheat the system. So, if you have no qualms about using a few proprietary software, you can install ATI Catalyst 11.5/fglrx 8.5 to make things work a little better. With Catalyst 11.5, the switchable graphics works very well - although you have to restart the system (X does not support hot-swapping GPUs yet). The proprietary driver is not bug-free but, in my experience, it has performed better than the open source driver. Now, download the new driver from AMD's server. You might want to download it in a new directory. Let us suppose, we will download it in the directory ~/Downloads/ati. After the installation is over, execute the command below to detect the ATI card. Restart your system and you should have fglrx running. If your hardware supports switchable graphics, you can do it using Catalyst. 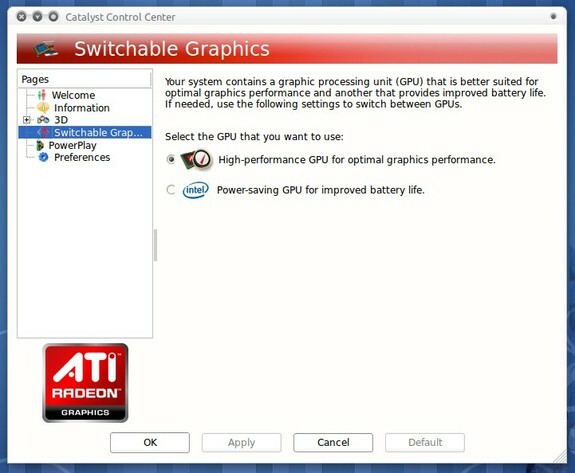 You can also use Catalyst to configure the performance of your graphics card.